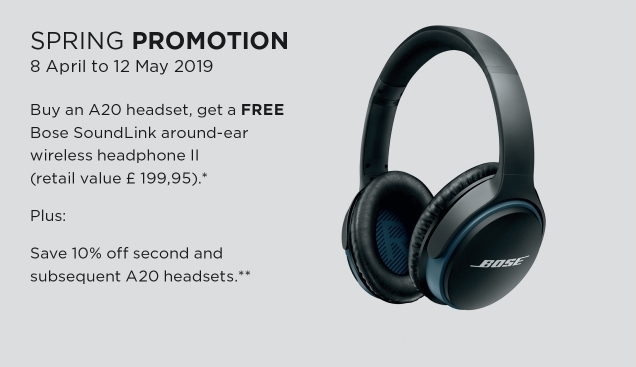 The Bose Aviation Headset A20 is a next-generation pilot headset. This Airbus XLR5 model features an electret mic with Bluetooth control module. Portable design enables use in multiple aircraft with straight cable and XLR5 Plug. This headset is supplied with a FAA 8130-3 Authorized Release Certificate. The XLR5 Connector works on: Airbus aircraft and some of the newer non twin plug Boeings. The A20 is the best ever aviation headset from Bose. More than 20 years ago, Bose introduced active noise reducing headsets to aviation and launched an entire industry. Year after year, pilots have made our headsets their #1 preference. Now, the A20 aviation headset introduces an entirely new standard. The redesigned control module now includes an auxiliary audio input with Intercom/AUX priority switching. Many pilots will want to use this input for dedicated GPS and traffic warning systems. You can set audio priority to mute the AUX input completely when intercom signal is detected, or to simply lower the AUX volume appropriately. Bluetooth® mobile phone connectivity allows you to receive calls wirelessly while wearing the A20 headset. And its enhanced EMI protection helps minimize interference from the mobile phone. Plus, the headset's integrated side tone provides a more natural feel to Bluetooth® phone conversations, even when you're disconnected from the intercom. The power system in the A20 aviation headset includes a smart shutoff feature that helps provide at least 45 hours of use from just two AA alkaline batteries. With the installed version of the headset, the technology intelligently switches from aircraft power to battery power as needed. The A20 aviation headset is available in an installed, aircraft-powered version and in portable, battery-powered version Significantly improved noise reduction across a wider range of frequencies. Proprietary Bose innovations now use microphones both inside and outside each ear cup to sense and reduce more ambient aircraft noise. Improved level of comfort achieved through choice of materials, distribution of weight throughout the headset, 1/3 less clamping force than most conventional noise reducing aviation headsets, and additional room for the ears. TriPort acoustic headset structure, available only from Bose, produces tonally balanced audio from relatively small and lightweight headphones. Active equalization electronically tunes the headphones' frequency response, enabling outstanding audio performance. Bluetooth phone connectivity lets you take calls wirelessly through the headset. Auxiliary audio input on redesigned control module for connection to GPS and other devices. Pushbutton Intercom/AUX enables priority switching. Bluetooth communications interface - wirelessly connects divices to your headset.